Featured image: Adapted from figure 2 of today’s paper. 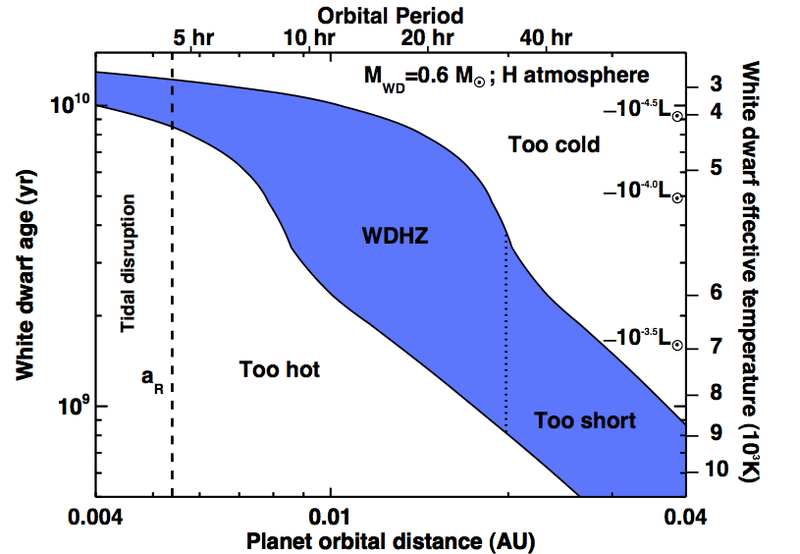 The explosion in the number of discovered exoplanets, especially some interesting systems with terrestrial planets in the habitable zone, has attracted a lot of attention. We are moving one step closer to the ultimate question — are we alone? Today’s paper brought us to look at certain distinctive spectral features that could be caused by “extraterrestrial plants”, or even crazier: advanced civilizations. Ever wondered why most of the plants look green? The first answer you might get is because of chlorophyll, the green pigments responsible for photosynthesis. Plants carry out photosynthesis to convert water and CO2 into sugar and oxygen, using energy from the sun. But one might further ask: why is chlorophyll green? Well, chlorophyll absorbs light primarily in the range from ~450 nm (blue) to ~650 nm (red). It operates in the visible spectrum range but is not as efficient in green light. So in visible light, the photons at green wavelength are reflected the most and produce the color that we see. This causes the small bump of the leaf reflectance near 500 nm (0.5 μm) in Figure 1. Note the sharp jump of reflectance starting around 0.7 μm and going into the infrared. This so-called “red edge” can be a useful feature for detecting vegetation on planets since few substances in nature have such high reflectivity in that wavelength range. The strength of the red edge feature is used on Earth to monitor the growth of vegetation (such as crops). Imagine if our eyes were a little more sensitive toward red; we would see the world very differently with plants turning red (and much brighter)! Figure 1. 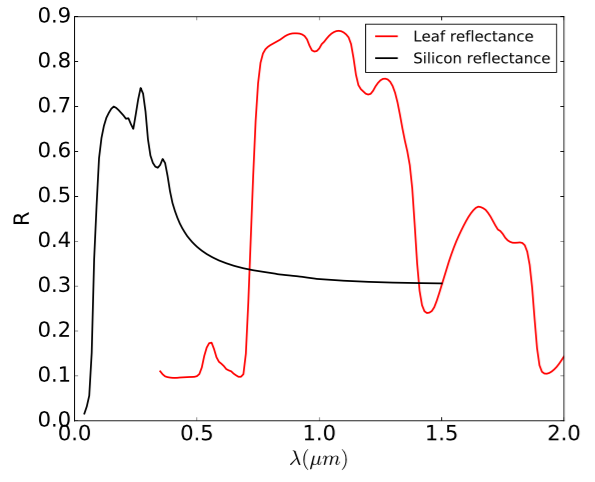 The reflectance R for silicon-based solar cells (black) and plants (red), shown as a function of wavelength λ. The peaks in the reflectivity in the UV region of silicon and at 0.7 μm of plants are the distinct “spectral edges”. In today’s paper, the authors also boldly explore the possible “artificial spectral edges”. That is, advanced civilizations modifying the planet surface such that it changes the observable spectra as well. It is conceivable to assume that advanced civilizations come up with a method to handle energy crises. One possible way is to harness a significant amount of energy from the star by constructing large arrays of solar cells. This is particularly relevant for tidally-locked planets around M-stars, such as Proxima b, where the dayside is permanently illuminated. The solar cells are made of semiconductors (typically silicon), which have an energy gap between the valence band and the conduction band. Photons with energies less than the band gap are being scattered, causing high reflectance, similar to plants but at a shorter wavelength in UV. The authors explored this hypothetical scenario, where planets are covered with mega-scale arrays of solar cells, showing the reflectance for silicon-based solar cells in Figure 1. Another similarity between natural vegetation and solar cells is that, on tidally locked planets, they most likely are only situated on the day side. Therefore, as the fraction of vegetation or solar cells varies during the orbit, the changes of photometric flux in different wavelengths could be analyzed to characterize the spectral features. The authors calculated the change in the reflected light contrast to be within the sensitivity of future telescopes, like WFIRST (10-3 ppm) and LUVOIR (10-4 ppm), provided that (i) the coverage is large enough, (ii) the viewing angle is favorable, and (iii) the cloud cover is limited. Of course, this is not saying we are going to find extraterrestrial life tomorrow, but it is helpful to keep in mind the possible information hidden in the reflected light. After all, the last thing we want is that we see the sign, yet miss it. The “featured image” is missing. Please correct the eror and re-issue the article. I teach astronomy to Middle Schools Kids ( 10 and 11 years old) One 10 year-old, after understanding the reflectivity of chlorophyll, suggested that instead of calling it the green revolution, we should call it “the everything except green, revolution” …Out of the mouths of babes !! You are teaching future scientists! I love what I do and thank you. I am retired and the past ten years may very well be the best years of my life because of this contact with the future.